Abstract- This paper explains the benefits of On-site mobile PV Test Laboratory developed in India by Mahindra Susten Pvt Ltd (MSPL) & launched in market in September-2017. This On-Site Mobile PV laboratory is the only one existing in India which can solve the problem of Quality assessment by eliminating the losses caused by transportation of solar modules in remotely located Labs for testing. This on-site PV mobileTest Lab has the capacity to perform the PV module flash test at STC condition complementing it with EL and IR image taken on field to check for any degradation in PV module power(Pmax).Degradation study is performed all over the world to evaluate the performance of PV module and deal with warranty related issues. This kind of mobile Lab minimises generation loss as all the measurements are taken during the non-generation hours. Mahindra Susten Solar Mobile PV Test lab has been developed for conducting quality test. There are various PV module testing Labslocated remotely all over Indiahowever, this may add the transportation cost and time. Thistechnical paper highlights the scope, advantages, features and need of the On-Site mobile PV modules test laboratory. A degradation study on various sites has been performed to check the feasibility of on-site mobile PV laboratory. A complete analysis and correlation of electrical characteristics, EL, IR and visual image is studied in this paper. This paper focuses on benefiting government body, customer, EPC and manufacturers for dealing with degradation related issues by recommending the cause and solution for module degradation. There liability of the long-term performance of a PV plant depends on timely performance evaluation of the modules present in field which can also cause significant revenue losses if ignored. The expected lifetime of PV modules can be achieved only if the quality of the plant is maintained according to the IEC Standard.This mobile PV Test Lab is one of its kind of mobile lab which provides a range of electrical and visual tests of PV modules as per IEC61215/61646 norms. The degradation of PV Module impacts the overall generation of the plant as each module is electrically interdependent with each other through string configuration. Hence proper quality check of the modules installed in the field is important so that proper action can be taken and power loss in the entire plant can be reduced. In India, PV module testing labs are available in various parts of the country. These labs are located away from the plant locations and not easily accessible. If any performance related discrepancy occurs in solar power plant, the conventional way is to send affected modules to the Testing Lab with the added cost of transportation and additional damage to the module if not treated delicately. This problem is solved by mobile PV laboratory developed by MSPL. Figure 1: Mobile PV Lab developed in India by Mahindra Susten Pvt. Ltd. 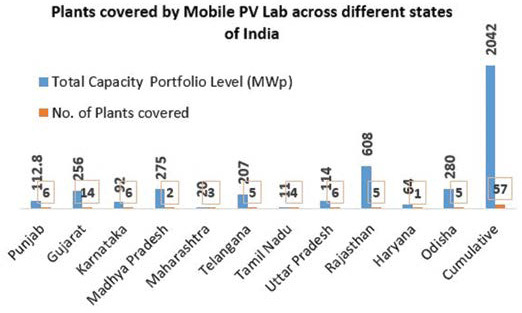 In Fig 1 it shows the mobile PV lab developed indigenously by Mahindra Susten Pvt Ltd. Its robust design can reach various geographical regions of India and can produce reports on the degradation status of PV modules in less than 3-4 days. This laboratory is maintained as per IEC/ISO 17025 standards for benchmarking and qualification testing as required for PV modules, thus it can contribute towards the goal of MNRE (Ministry of New and Renewable Energy, India) of seeking quality check in solar PV modules. The mobile lab comprises three major equipment’s namely Flash tester, EL (Electroluminescence)Tester,and Thermal Imaging camera. The flash test is being done with the help of an AAA-class Solar Sun Simulator which gives the I-V characteristics of the PV module at STC (Standard Test Condition). IR(Infrared)Scanner/camera is used to detect any hotspot in the module usinga thermal imaging technique. 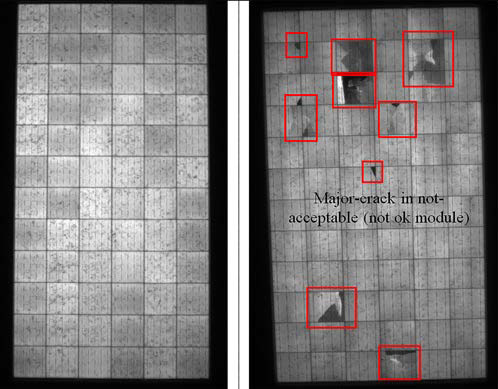 The EL imaging of the PV modules helps to identify micro cracks and effect of PID (Potential Induced degradation) in Modules. This lab has a failsafe system which comprises very robust design with no movable parts.The Sun Solar simulator is of AAA-class which can be used to test modules of all type of current technologies (mono-Si, poly-Si, Amorphous silicon (aSi, CIS, CIGS), CdTe, HIT & high efficiency). This lab is builtto meetISO/IEC 17025 Standards enabling it to maintain standards of PV Plant with proper Quality assurance procedure. The lab is accredited as per ISO\IEC 17025 norms by NABL (National Accreditation Board for Testing & Calibration Laboratories) an autonomoussociety providing Accreditation (Recognition) of Technical competence of a testing, calibration, etc. NABL has mutual recognition arrangements with Asia Pacific Laboratory Accreditation Cooperation (APLAC) and International Laboratory Accreditation Cooperation (ILAC). When compared to a traditional horizontally mounted system for I-V testing, the vertical mount structure for flash test and the EL measurements provides an all in one solution cutting down the time required for test analysis and report making. This is the first of its kind in India providing a range of electrical and visual tests including Flash test, EL Test and Thermal Imaging of PV modules as per IS14286/IEC61215. It requires ZERO set up time for the Dark Room.The lab has integrated living space for an engineer for instant reporting. It is equipped with integrated distributed generation to work without site auxiliary power supply (self-powered). Robust and compact model of Lab maintains the STC conditions required for testing, fail-safe operations integrated with the Climate 25c feedback to ensure any error due to non-uniformity of temperature and it is interlocked with Alarms. This robust model of PV Lab is a way towards PV module sustainability. The traditional PV module I-V testing is performed in ambient environment with irradiance 700to 1000W/m2. These I-V results are then translated in compliance with the norms of IEC60891. However, translation procedures are prone to error and require the testing of the module in operating time, for which combiner box/ string inverter should be disconnected during measurement as it disturbs the power generation process. The mobile PV Lab I-V test can be conducted during the non-generation hours which don’t affect the generation of PV plant. Another advantage of PV mobile lab is that STC condition can be maintained in the lab and no need of any translation procedure which is prone to any high uncertainty for the power degradation calculation. 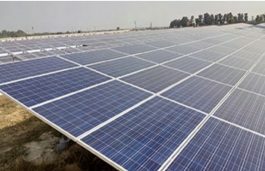 Advantage of Quality Control: The rapid performance assessment of PV modules is a big advantage for solar power plants in India. 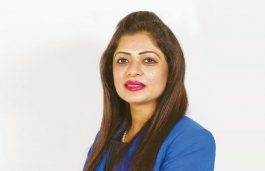 To survive in solar business the EPC contractors and manufacturers need to maintain the module quality for best output. Periodic check of module ensures sustainable outcome with assurance to customers which will enhance the productivity in market for the business. Government can build guidelines for setting warranty conditions and methods to follow by the consumer in field to avoid damage of the module. PV module quality control guidelines can be established by manufacturers to achieve module reliability from previous flaw by periodic PV plant survey. PV system designers can build models that can reduce the possibility of degradation in modules from recommendation of module quality inspection.Warranty claim of modules can be made easy by a certified method for Quality check which will help both module manufacture and client. Manufacturer: Manufacturer should have the time zero data of the modules as the defects caused due to transportation and handling cannot cover the warranty terms of the module. The Quality inspection of module can give the details of type of defects which can help to prove the claim for warranty if modules are degraded abruptly. EPC provider: EPC contractors install the modules on the field, so it may happen that the defects are due to workers improperhandling or dimension. So safety guidelines build after testing the modules can help to resolve the issue of warranty claims after installation. User: The user may be individual customer or utility. The user may not be aware of the reason of degradation so quality check with this kind of mobile PV Lab can give deep results with reason of degradation where claim to warranty can be initiated. 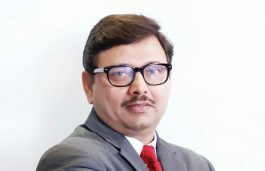 Government Perspective: Government may want to setguidance for warranty terms and such kind of deep investigation can help to build guidance with detail survey which has compatibility with IEC Standards. Revenue: A 1GW plant with extra 1% degradation in the 3rd year of operation assuming average solar PV Tariff of $0.07/kWh if a 1MWp plant generates 1.60 million kWh/yr, 1% extra module degradation can cause loss in generationof 0.016millionkWh/yr. In a 1 GWp plant the generation loss would be 16millionkWh/yr which corresponds to $1.12 million per year. For remaining 22 years there would $24.64 million revenue loss in a 1GWp plant which is quite high. Therefore, identifying faulty modules can save revenue loss by quality control. Optical Degradation: Exposure to ultraviolet (UV) rays, temperature or humidity can cause yellowing of encapsulate. It can also occur due to diffusion of dirt and moisture ingress. Light Induced Degradation (LID): Light-induced degradation can be detected by continuously monitoring or by periodic measurement of IV characteristics. Temperature Induced Degradation: The irradiation emitted by Sun is transferred into heat which causes temperature induced degradation of the module. IAM: Over a period of time the Incident Angle Modifier have significate impact on performance due to deterioration of front glass layer. Soiling: Soiling leads to mismatch issues in cell due to which cells may degrade and output of the module can be effected. It can also cause hotspot in modules due to which degradation of modules or bypass diode failure may occur, this may also permanently damage the module. The degradation of the module depends on a number of parameters. Improper transportation can even produce cracks in good factory tested modules. Mismatch effect in modules or string not only causes power loss but also form hotspots which can degrade the module completely or more severe effects like sparkling or burning of modules can take place. If one of the modules is degraded, due to a mismatch in the string it can also degrade the other modules in the string. It is important to analyse the degradation cause in any plant so that effects can be minimized, and quality can be maintained. 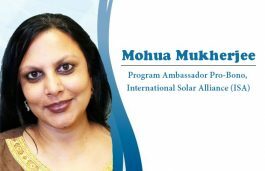 Sustainability of PV plants can be achieved if the modules are checked for its quality and degraded modules are replaced. This can only be done if the modules are surveyed periodically with the help of electrical characteristics, visual check, EL and IR of the PV modules. 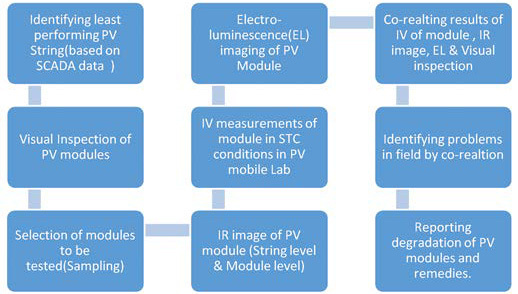 Figure 2: represents methodology for quality control in PV plant with mobile PV testing Lab. PV plant can be checked for its quality on timely basis with using this mobile PV Lab. The process of quality control initiates with identifying the modules to be tested. Identification of least performing PV string is done with the help of SCADA. If SCADA data is not available for small plants, identification of least performing string can be done by taking string I-V tracer. Depending on the performance of the string least and medium performing strings are selected for testing. Pmax1 – Nameplate maximum power or time zero maximum power at STC. The EL measurements were done in a complete dark room to classify the micro cracks present in the module. EL image of the module is taken in the lab which is used to detect defects in module i.e. to identify completely dead cells or partially defected cells. A co-relation between the results of IV of the module, IR image, EL & visual inspection is obtained to identify the problems in field and a proof to claim replacement of the modules if warranty conditions is not satisfied. The mobile PV Lab has visited 57 sites all over India till now and has tested different technologies and module make.The modules are surveyed depending on the requirement of site. Figure 3: represents number of plants tested in different parts of India. MSPL Solar Mobile PV Test Lab has a portfolio of more than 2GW plant from September-2017 to December-2018. The results of the same is mentioned in below section. Quality survey of the plant is initiated by shortlisting modules for testing from SCADA data. Selected samples go for testing and visual check of the module is performed to identify any defects on the module. A module with bird droppings can cause mismatch issues in module. Figure 4: represents an IR Thermography image of ok module and module affected with hot-spot in field. The IR inspection of modules is done as per IEC 62446-3 temperature difference in cells leads to hot-spot which is detected by IR camera. This IR imaging of a module can detect hotspot or LID affected modules. Bypass diode failure or dead cells with high temperature can be detected using IR image. IR image is taken in string level then modules with defects can be identified. It was observed that 0.06% modules per plant were found to have defects per year based on thermographic inspection. no of noncritical cracks increased by 0.2% (0.15% to 0.35%) which hampers the power generation between 0-2%. 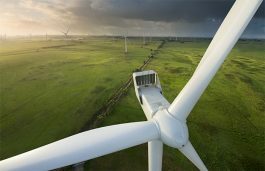 The portfolio considered for this study was 2GW. 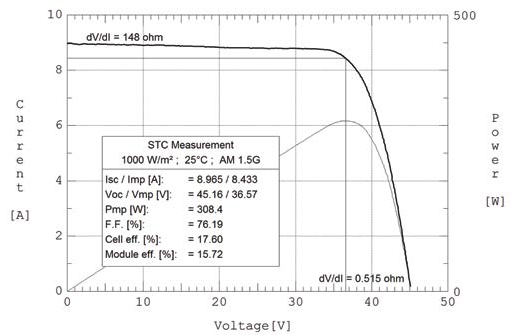 Figure 6: represents PIV (power, current, voltage) curve of a PV module at STC condition measured with help of Sun simulator which give the electrical parameter of PV Modules as per IEC60904-1/IEC61215-4.1/IEC61646-10.1. Figure 7: shows the average results of I-V characteristics test performed in mobile PV Lab Sun Simulator at STC condition where lab temperature was maintained at 25 °C. In each site 20nos (min sample of each Wp & type) of PV modules were tested and modules were divided into different make and technologies. Then average value of measured Pmax degradation was calculated for each manufacturer’s& history of PV Module data collected from different plants. The above graph shows Pmax degradation of module with outlier and without outlier. 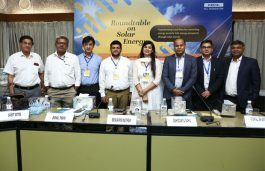 The performance of PV Module with degradation >1.2%/yr is considered as outlined modules as found various modules shown degradation upto 14% in 1st 3 year of field operation. The modules were divided into various age group. Poly-Si modules with age 0-2 years showed a degradation of -1.68%/yr with LID effect, however modules with age group 2-5 years showed -0.91%/yr degradation. Approximately 5 % manufacturer’s Flash test results encountered with module degradation around 12% within first three years. Thin-Film modules is found to have positive power in first 2 years, possibly due to over rating of modules. An average degradation of -0.62%/yr is seen in Thin-Film modules. It has been observed that after third year of operation even Teir-1 supplier’s module are degrading 4%-8% within a year, hence cumulative degradation of these modules becomes 8-12%/yr. The on-site mobile PV Lab enables the testing of PV plant with the same efficiency as PV test Lab located remotely with added advantages of cutting down the handling loss of modules during transportation. This PV mobile lab can help the testing domain of industries in India to get accurate test results with compatibility with IEC 17025 norms which is globally acceptable& this can empower the power of Sustainability in SPV Plant & Module manufactures. The whole idea has a potential to take ahead the power of sustainabilityin PV power plants. PV mobile lab is future of market & can help the testing domain of industries in Global to get accurate & reliable test results. The EL tests shows that no of micro cracks increases (%) from pre installation to post installation which brings down the power generation of the respective string. 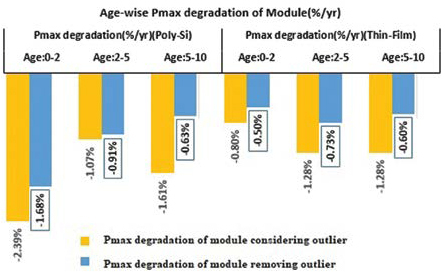 In Flash test results it shows the Pmax degradation of healthy modules reflects 0.6% per year while the majority population (60%) of modules shows 2.6 times degradation than healthy modules. The degradation of Thin-film modules is found to be lower than poly-Si modules. Quality results within 2-3 days of testing are its asset, unlike traditional test in remotely located labs enable to maximize the plant performance with quick results. Replacement or warranty claim of modules can be initiated with the help of this lab hence repowering.